There’s no way to put in words how disappointing it must be to be a Chelsea fan. After winning the league in fancy fashion last season, Jose Mourinho really seemed to have lost the locker room in this one. The 2015-16 season has seen the Blues side break all the wrong records as they forayed to retain their crown. Three loses and a draw in their first five premier league games set the tone for the rest of the year as Mourinho struggled to bring out the best of Eden Hazard, Cesc Fabregas and Diego Costa. A trademark Mourinho win over Arsene Wenger and Arsenal seemed to give the Stamford Bridge faithful some temporary relief, but the tides were not to change. Disappointing results, the Eva Carneiro debacle, and unending rumours that the Chelsea squad had fallout out of favour with Mourinho left Chelsea hanging cold in 14th place at the start of December. Calls for Jose to be sacked began to ring around London and the media went into frenzy. Two consecutive premier league defeats to Bournemouth and Leicester City seemed to be the final nail in Mourinho’s coffin and he was sacked before the turn of the year. Fans were back with their Chelsea merchandise and Chelsea goodies in the stands to rally the troops once again. The new year began with Guus Hiddink as interim manager and the Blue lions going undefeated for all of January. It was a sign of things to come as the Dutchman managed to pick up the spirits of the players and brighten the mood at Stamford Bridge. A series of promising displays in England were marred by their UEFA Champions League exit to PSG but the Blues currently sit in the top half of the table and can only look up. With eight games to play, John Terry and his band of brothers have nothing but respect and pride to play for, and the road ahead is not an easy one. Tottenham Hotspur, Leicester City and Manchester City are yet to visit Stamford Bridge while the blues also have an away trip to Anfield before the end of the season. From just these four fixtures, it is hard to tell how many points could be won or lost – such is the nature of this season, but Chelsea fans will have their eyes set on a Europa spot for sure. As a Chelsea fan, it’s time to pick up the pace and raise your voices and help the Blues finish this season on a high. If not for anything else, at least to ensure that the next manager to walk in through the doors at Stamford Bridge is welcomed with many Chelsea Gifts in hand! 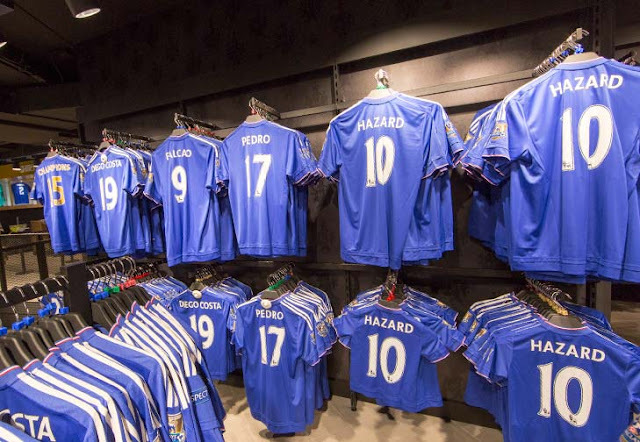 If you’re a true blue fan and are sticking by the team in these times of trouble, we’ve got tonnes of Chelsea merchandise and memorabilia for you right here - https://www.goalsquad.com/football/chelsea-f-c. Get shopping and get set for strong title challenge next season!